A truly stunning cake made up of five of the very best British Cheeses. To serve approximately 75 people. 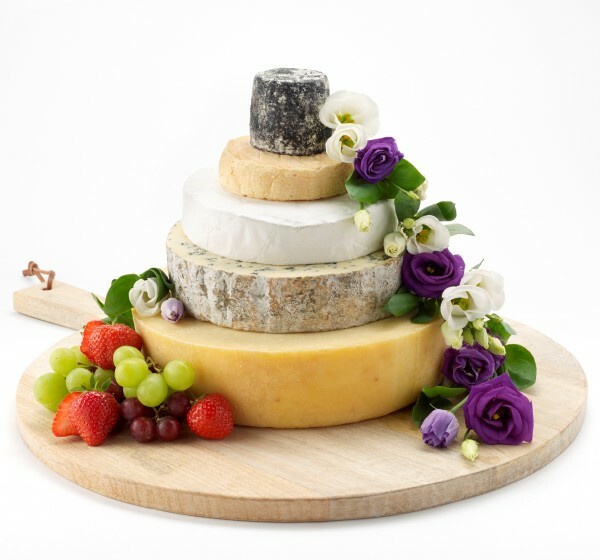 A Celebration Cheese Wedding Cake featuring some of the best British cheeses that Paxton & Whitfield has to offer. To serve approximately 75 people. The diameter of the base cheese (Mrs Kirkhams Lancashire) is approximately 26cm. This cake requires a lead time of three weeks please. Mrs Kirkhams Lanacshire 3kg - A farmhouse Lancashire made using a traditional two day curd method. Lancashire is open textured, buttery with a hint of sharpness. Perl Las 1.2kg - A superb Welsh blue cheese, golden in colour, with a creamy, gently salty taste that grows stronger with maturity. Wigmore 800g - A sheeps milk cheese with a slightly sweet yet flowery taste. The texture is fairly firm when young and runny when older. Wigmore is handmade in Berkshire. Golden Cenarth 200g x 2 - A rind washed soft cheese made in West Wales from cows milk, with a springy, supple texture and buttery flavour.